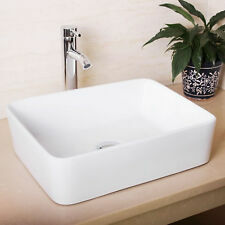 UK New Modern Square Table Top Wash Basin Designs Small Lav Toilet Sinks. Made to a high quality this countertop basin can be used with a mono basin tap. Inludes: Basin. White high gloss glaze. The glaze is smooth ,flushing smoothly ,not easy to attach the dirty or remain water stains. This is the reason I did not use the item myself. I can give you his details if you would like them. 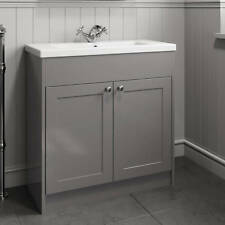 AMAZING QUALITY BATHROOM CLOAKROOM COUNTER TOP BASIN SINK. This high quality modern design countertop basin creates functional art for the bathroom or cloakroom. They would add this contemporary charm to any size bathroom that had any style. 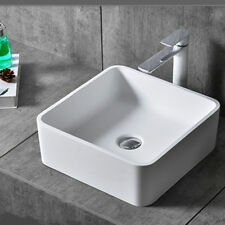 32.5cm x 28cm x 100cm Ceramic Counter Top Wall Hung Basin With Mixer Tap. Cloakroom Wall Basin With Mixer Tap Excellent condition 32.5cm W by 28cm D by 100 H Tap is 16cm H.
TYPE: Countertop Basin. CONTENT: ONLY BASIN. Manufactured of quality white ceramic, finished in a high gloss glaze. The contemporary yet simple design looks fantastic in most settings. SLIPPER BATHS. TOILET SEATS. FLOOR STANDING BASIN. SHOWER BATH. BATH SHOWER SCREEN. SHOWER ENCLOSURES. CORNER BATH. BASIN & TOILET SUITES. Sleek European inspired modern contemporary Art design Luxury oversized creation Premium quality tempered glass construction Above the counter installation Chrome pop-up drain included Sink Material: Tempered glass Overflow: No Installation Type: Above the counter What’s Included: Bathroom Chrome Single Handle Waterfall Tap Mixer Faucet Glass sink Chrome Pop-Up Drain Installation accessories Notice: all the painting are hand made, so there might be a little bit difference of the painting lines between two pieces. 900mm Glass Basin Specification. SLIPPER BATHS. TOILET SEATS. FLOOR STANDING BASIN. SHOWER BATH. BATH SHOWER SCREEN. WALL HUNG TOILETS. All in all, is a wonderful bathroom asset that can inject valuable storage space into your bathroom. This elegant washbasin gives a certain amount of uniqueness to your bathroom. It can be combined with all furnishing styles. washbasin in modern design. 1 x washbasin WBCK03 for self-assembly. rectangular shape in bright white colour. Ceramic washbasin, 43 cm long. Ceramic washbasin; 33.5 cm long. Ceramic washbasin; 48.5 cm lan G. Ceramic washbasin; 41.5 cm long. Ceramic washbasin, 49 cm. Ceramic washbasin; 30.5 cm long. Ceramic washbasin; 43.5 cm long. Basin Split: Single. Sink Installation: Undermount. Product Color: Antique Copper. Material: Copper. Made of solid copper. Faucet Centers: No Faucet Hole. Faucet Holes: No Faucet Hole. Shape: Rectangle. Give a luxury look to your kitchen with a beautyful copper sink. Solid copper construction. Made of 16 gauge copper. Details: Type:Countertop Sinks Material: Tempered glass Special Application: Handwash/Shampoo sinks Basin Shape:Rectangle Processing:Hand Painted Faucet material: Brass Faucet finish: Chrome Valve Type: Ceramic Valve Hot and Cold: Yes Waterflow Way: Watefall Features: Sleek European inspired modern contemporary Art design Luxury oversized creation Premium quality tempered glass construction Above the counter installation What's Included: Glass sink Faucet Chrome Pop-Up Drain Installation accessories. This is one of our most popular basins as it’s such a well-designed basin which looks great in almost any setting. The internal overflow is also a great feature. Overflow: Yes (positioned at the front of the basin). Bathroom or Cloakroom use. CLOAKROOM SUITES. SLIPPER BATHS. TOILET SEATS. FLOOR STANDING BASIN. SHOWER BATH. CORNER BATH. BATH SHOWER SCREEN. This elegant rectangle ceramic counter top basin with its sharp edge design, providing truly a modern but classy look. The Summit freestanding basin is suited to any bathroom counter top situation, giving a real look and feel of quality and class as it is constructed of glazed vitreous china with a high gloss white finish. Basin Split: 50/50. Basin Length: 19-1/8". Basin Width: 17-7/8". Material: Copper. Faucet Centers: No Faucet Hole. Sink bowl is pressed; contains no internal welds. Faucet Holes: No Faucet Hole. Apron Front Rim Thickness: 2-1/2".